Thick, glossy, smooth, creamy, rich, beautiful and delicious – these are just some words to describe one of Earth’s greatest food invention ever – pastry cream. It is one of the easiest and most delicious concoction that can be used as a filling for cakes, tarts, and most notably, choux (cream puffs and eclairs). Custard: A mixture of milk and eggs thickened by gentle heating. 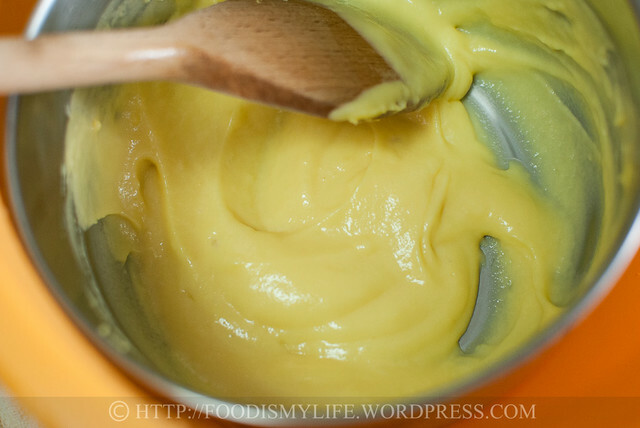 Pastry cream: Similar to custard, but with flour / starch added in to act as a thickener. It’s also known as the confectioner’s custard. Crème pâtissière: The French name of pastry cream! See the vanilla specks? Sorry, can’t help but to crop a picture just to “show off” the pretty vanilla seeds. Yum! 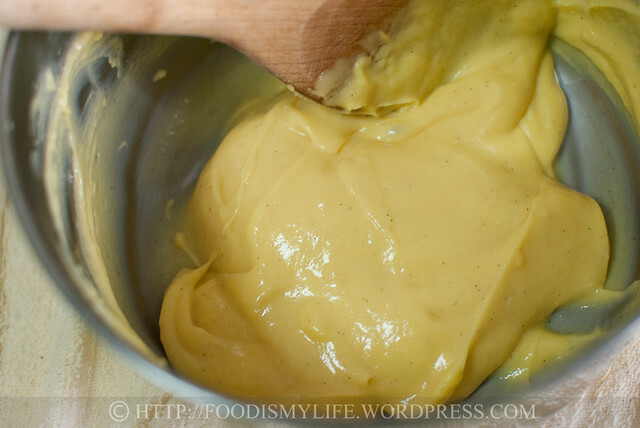 When I was younger, I did attempt making pastry cream before with custard powder (the attempt ended up as a flop because I think I overcooked it or something… can’t really remember). 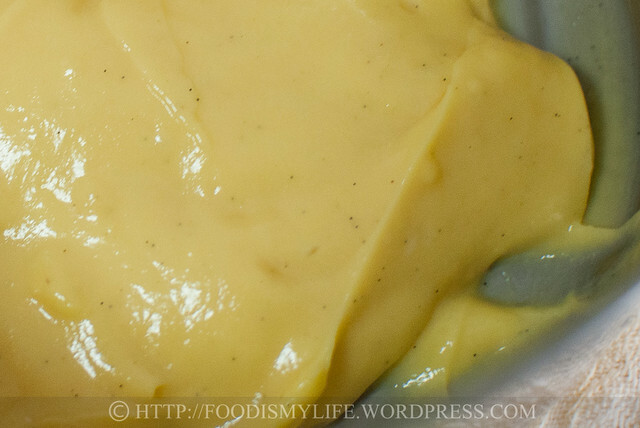 After researching today, I found out that custard powder is just simply cornflour and sugar that are coloured and flavoured. It was invented by Alfred Bird in 1837, and was a great alternative for people who cannot eat eggs. I remember using only a little of the custard powder to make the cream, and the rest was left in the shelf to get… expired. So it’s really a waste of my money to buy custard powder to make pastry cream. First grab some eggs and sugar. Whisk them together until you get a lovely pale mixture. 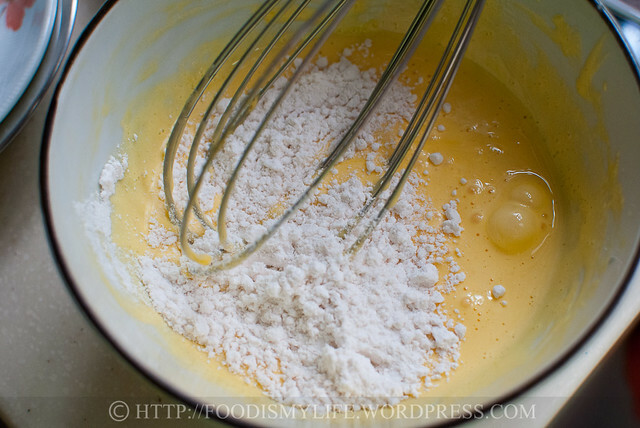 Add / sift in the flour and whisk to mix them together. 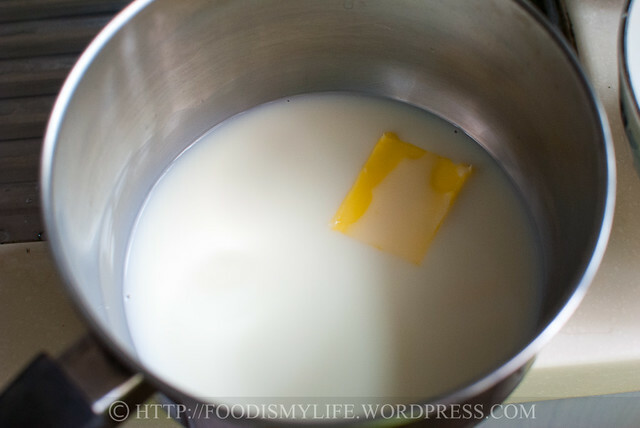 Combine some sugar, butter and milk in a pot. Bring it to a simmer. 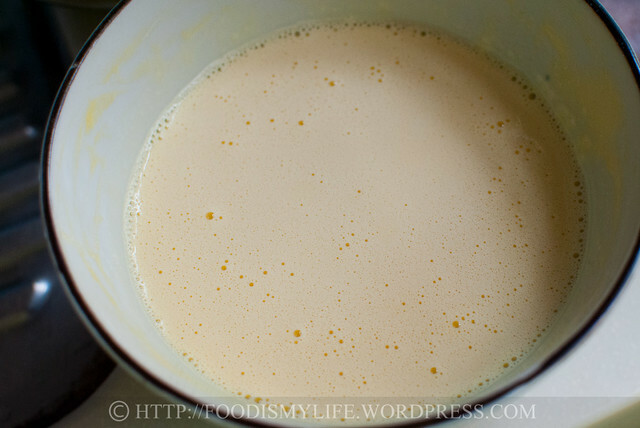 Pour the milk mixture little by little into the egg mixture, whisking the egg mixture constantly. This process is called tempering. Tempering is a heat process used to stabilize certain products. When the hot milk is slowly added into the eggs, it gradually brings the temperature of the eggs up without scrambling them – this allows a perfect and smooth consistency. Chocolate is also tempered to stabilize the fat in the chocolate so that it does not “bloom” when it cools. Pour the mixture back into the pot and cook over medium heat, stirring constantly. Place the pot in a large bowl of ice water and stir constantly until the pastry cream has cooled to room temperature. Stir in the vanilla paste. Cover the surface with a sheet of clingfilm and refrigerate till ready to use. This cooling step is actually optional – you can just stir in the vanilla then place a sheet of clingfilm on the surface of the pastry cream and let it cool slowly. But I was in a rush so I decided to cool it in a water bath. And the pastry cream’s ready! Use it as a filling for cream puffs! Yum! Prepare a large bowl of ice water (enough to put a pot in). Set aside. 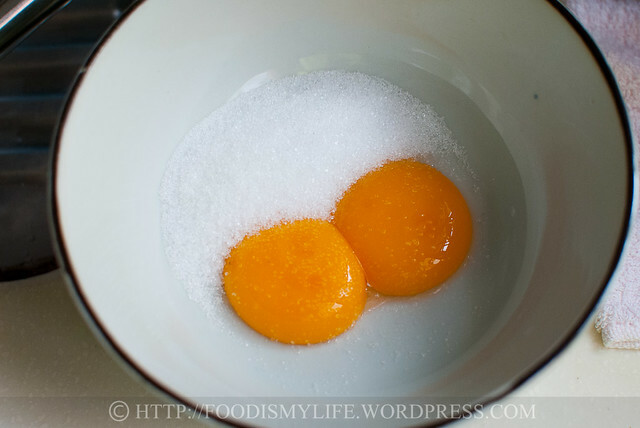 Combine 40 grams of sugar with the egg yolks in a large bowl. 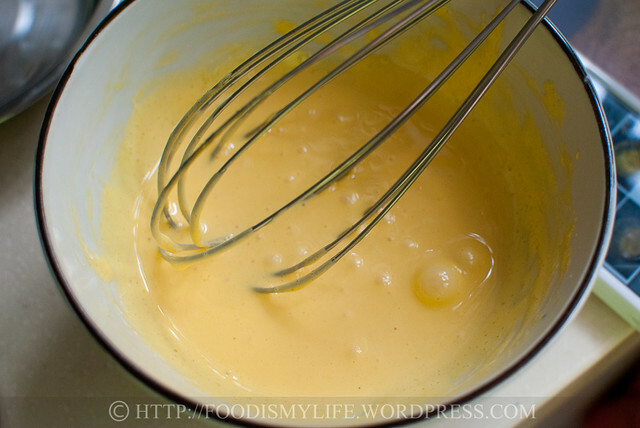 Whisk immediately with a wire whisk until the mixture is pale and smooth. Sift in the flour and whisk till smooth. Set aside. Combine the milk, butter and the remaining 10 grams of sugar in a medium pot and warm over medium heat until it comes to a boil. Remove from heat. After ¼ of the hot milk has been added, add the hot milk in a slow and steady stream, whisking constantly - until ¼ of hot milk is left. This whole process is called tempering. 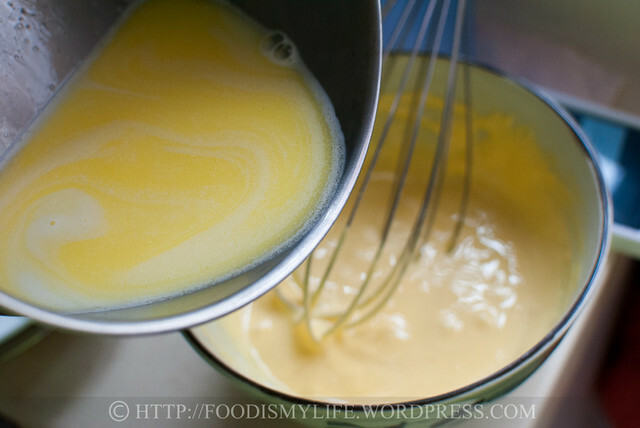 Once the egg yolks have been tempered, pour the egg yolk mixture back into the pot and whisk to mix them altogether. 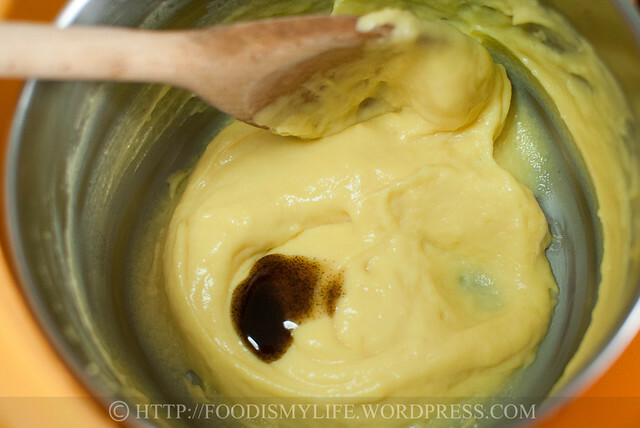 Place the pot back on medium heat and with a wooden spoon, stir the mixture constantly until the mixture has thickened and has started to boil - you'll see huge air bubbles popping out of the custard - that's a sign that the pastry cream is ready. Remove the pot from heat and place it in the bowl of ice water. Stir the pastry cream constantly until it has cooled down. Stir in the vanilla paste / extract. If using immediately, spoon the pastry cream into a piping bag and keep it refrigerated until needed. If not, transfer the pastry cream into a container, place a plastic wrap (cling film) directly onto the surface of the pastry cream (to prevent a skin from forming) and refrigerate for up to 3 days. You can use vanilla bean instead of vanilla extract / paste. Simply split 1/2 of a vanilla pod in half, scrape the seeds off the vanilla pod. Add the seeds and the pod into the milk mixture and bring to a boil. Remove from heat and let the vanilla pod steep for 15 minutes to infuse the milk with flavour. Remove the vanilla pod and proceed as per normal. Rinse and dry the vanilla pod – place it in a jar of sugar and let steep to get vanilla sugar! You don’t have to cool the pastry cream in an ice water bath – you can let it cool in a large shallow pan, but do cover the top with clingfilm to prevent a layer of skin forming on top. 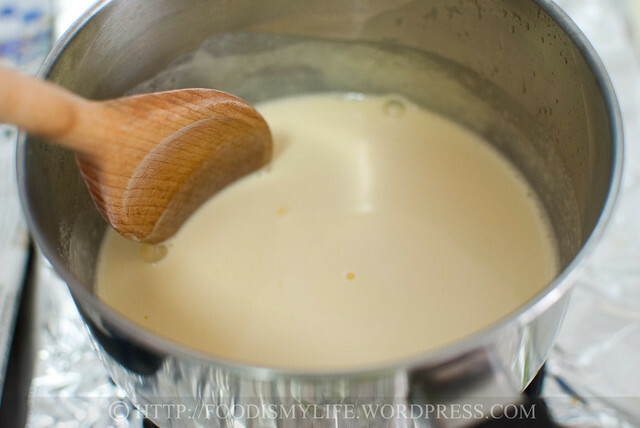 If you’re making a large batch of pastry cream, when the pastry cream is cooking in the pot, you must stir it constantly and pretty vigorously, scrapping the bottom of the pot all the time so that it doesn’t burn at the bottom. Thanks for the research/info! I had hoped to get to making one tonight or tomorrow morning, but work (at times unfortunately) trumps baking. Fingers crossed, Sunday! Hi Chris, me too! So in love with them! Think I’ve only ever made this once before, and was pleasantly surprised at how easy it was to make. Sooooo delicious! A profiterole filled with a fine pastry cream is, for me, one of Life’s great pleasures. Your opening photos literally had me salivating. Yes, I love pastry cream! Yum, yum … I love these! This looks amazing. I always wondered how this was done. thank you for the simple explanation! Would a half batch of pastry cream fill a tart or a full? Yum! I’ll take a bowlful for my eclairs, please! Great recipe, I make mine in a similar way. perfect texture! 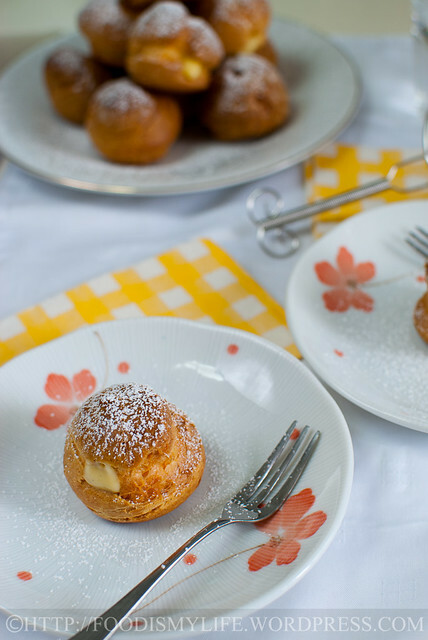 i also used vanilla custard for my cream puffs, it was good , will chk out your cream puffs tomorrow!…actually it’s today!! haha! I’ve made it a few times, once for my eclairs and twice for a layer cake! It’s so delicious! I haven’t made puffs yet though.. Yours look so pretty! I love pastry cream! Thanks so much for this awesome post and the step-by-step photos and instructions. I have a feeling I’m going to be consulting this post again and again whenever I need to make this. Beautiful! Funny how I just made choux pastry and creme patisserie too! I love creme pat ESP with those vanilla bean seeds! Perfect pastry cream just the right consistency!! Your little pastries look wonderful. Thank you, now how do you make the white cream? That’s the one I like, but I’m sure it’s so much worse for me.